This is something that I have always wanted to make but was for some reason intimidating, I think it’s the dumpling part that had me scared. So last week with all this crazy cold weather here in the Northeast I decided to put my fear aside and found out there was nothing to be afraid of! 1. Mix flour, salt and pepper and dredge the chicken in the mixture. Heat vegetable oil in a large Dutch oven over medium-high heat. 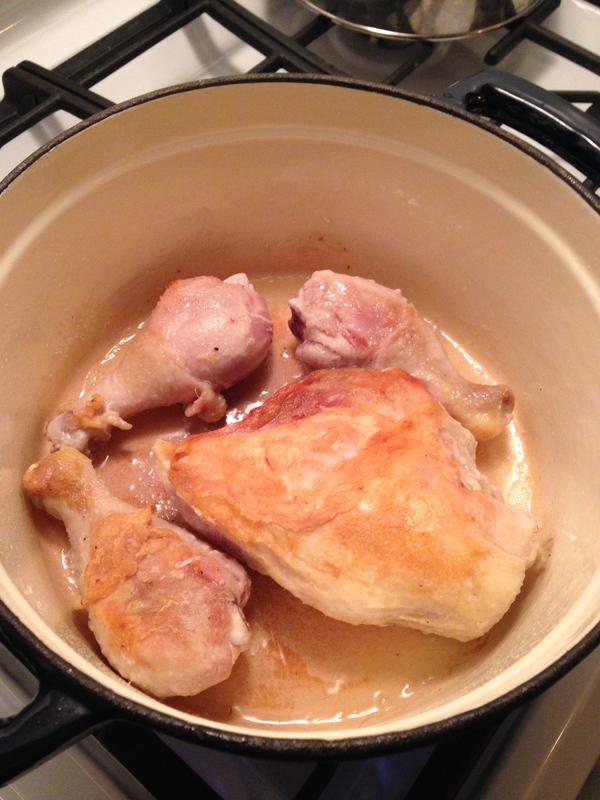 Place chicken in heated pan to brown it on both sides, about 5 minutes each side. Don’t overcrowd it in the pan, do it batches. Don’t worry about it cooking all the way through, it will finish cooking in the stock later. Put browned chicken aside. A batch of chicken being browned. 2. 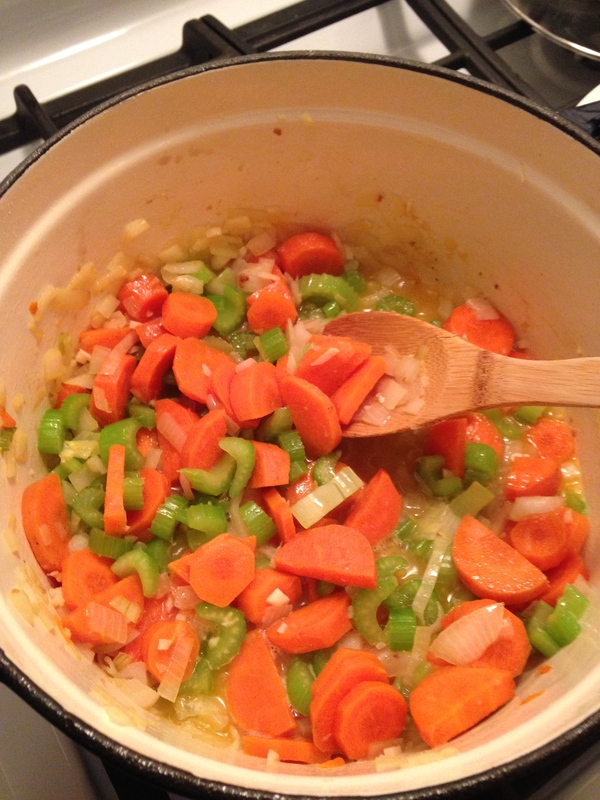 In the same Dutch oven, add carrot, celery, onion and sauté for about 5 minutes. Add garlic and sauté for another minute. Sprinkle vegetables with flour and toss to coat, cook another minute. Add white wine and deglaze the pan, and dissolve the flour. Add chicken stock, bay leaves and pepper corns along with the chicken. Cover the Dutch oven and cook for 20 minutes. 3. 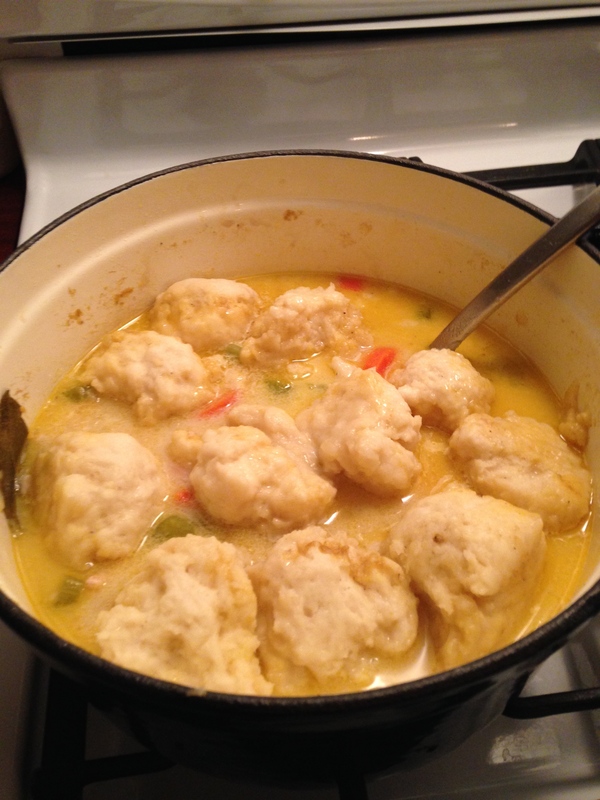 While the chicken cooks in the broth, make the dumplings. In a medium mixing bowl, mix together the flour, baking powder and salt. Add melted butter and 1 cup of the milk and stir well to mix. If dough is too sticky add more flour, if too dry add a bit of milk. It should be thick and cake-like. Do not over mix. Using a spoon scoop out 2 inch dumplings and put on a wax paper lined baking tray. Set aside. 4. Remove the chicken pieces from the broth and using a fork pull the meat off the bones and shred. Return shredded chicken to the broth. Remove bay leaves. Bring to a simmer and add dumplings. Cook, covered for 15 minutes, do not remove the lid while the dumplings are cooking, this is very important! This way they will be light and fluffy. After the 15 minutes remove lid and add heavy cream, parsley and thyme. Season with salt and pepper to taste. Bon Appetit! The finished product…the ultimate comfort food!